It will be clear that on any given latitude and for any given period of the year, true north will be given by the sun at any time throughout the day if we mark on the compass plate the position got from Davis' tables (azimuth tables), in wich the shadow should fall at each hour or half-hour. We have only then to turn the plete round till the shadow actually does fall on the spot marked for the particular time of day, and the plate will then be correctly oriented. We can have a separate set of graduations for each latitude. In the universal compass each set of graduations is arranged in the form of an ellipse. Each ellipse corresponds to a particular latitude. 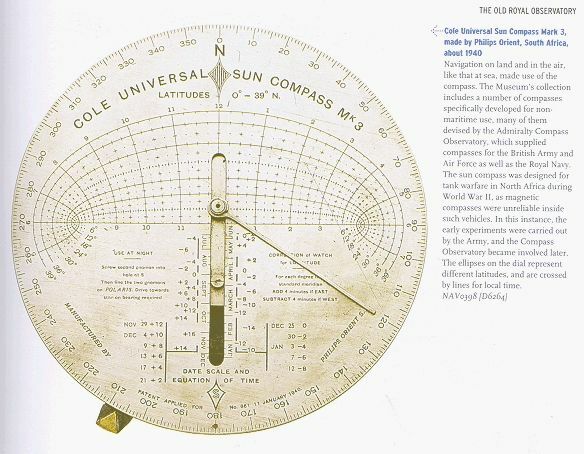 To use the compass, the shadow must be kept on the time of day, from one hour graduation to the next, allong the correct ellipse for the latitude of the place. As long as this is done, the arrow wich is in line with the figure XII on the compass plate remains pointing to the true north. 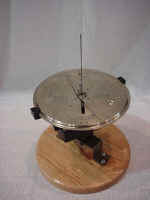 For convenience in keeping yhe shadow on the right point on the right ellipse a white pointer is attached to the base of the needle, and can be moved by hand every half hour or 15 minutes along the time scale. The shadow can be kept on the pointer, so avoiding continuous reference to the graduations. 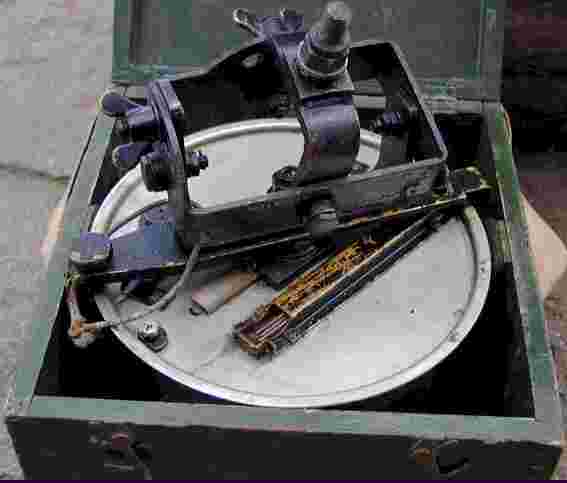 The variations of the azimuth from week to week is catered for very simply by sliding the whole plate north or south with reference to the needle. The correct position for the plate is given by a date scale engraved along the slide-way. The plate and the slide-way with its north-pointing arrow can together be rotated over a circular plate wich is graduated into 360 degrees. 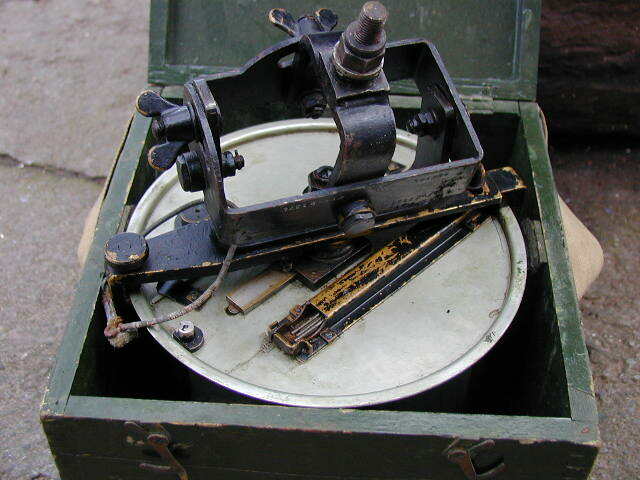 The circle is fixes to the vehicle so that the 0°-180° lubber line is truly for-and-half, with the 0° mark towards the front. 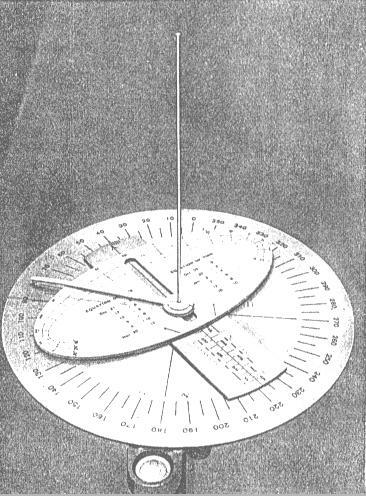 If the aroow is set to any given bearing on the circle, (41° in the setting shown in photo 1) and is kept on the meridian by the shadow and pointer, the vehicle is kept on the required heading. In order to set the lubber line accurately for-and-half on the vehicle, the needle is removed from the central position and inserted in a hole on the 0° circle graduation. A second needle is provided, and this is inserted in another hole on the 180° graduation. The two can be used as sights. 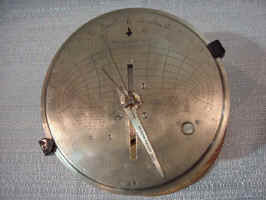 For use, the Universal Sun Compass needs only a watch set to local solar time. The compass carries on it all the information required to operate it. 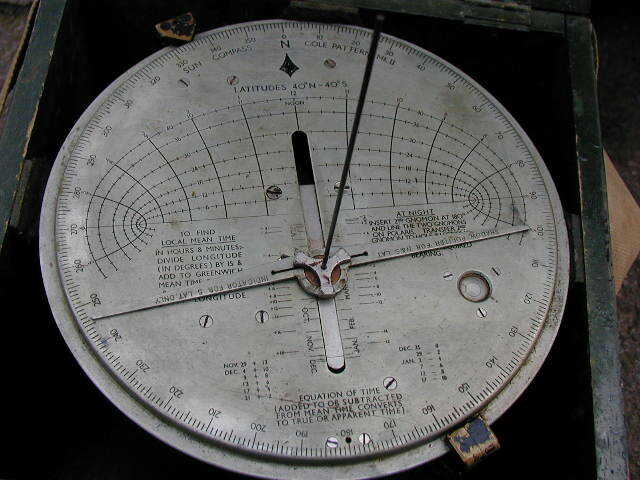 Since, however, the shadow indicates directly a time and not a bearing, and since it must be re-set by hand in order to read any new bearing in which the vehicle may happen to head, this type of compass is not suitable for continuous navigation. It is nevertheless a usefull and simple instrument for keepind a vehicule on a straight pre-ordained course.